Spiced peaches are the best condiment to serve with turkey. Make them now and enjoy in November! Ahhh...Spiced Peaches. Preserved in a cinnamon-spiked syrup, these little gems are so perfect with any light roast, whether poultry or pork. Their sweetness and very slight piquance balance and add moisture; they are almost chutney-like; that's the closest analogy. 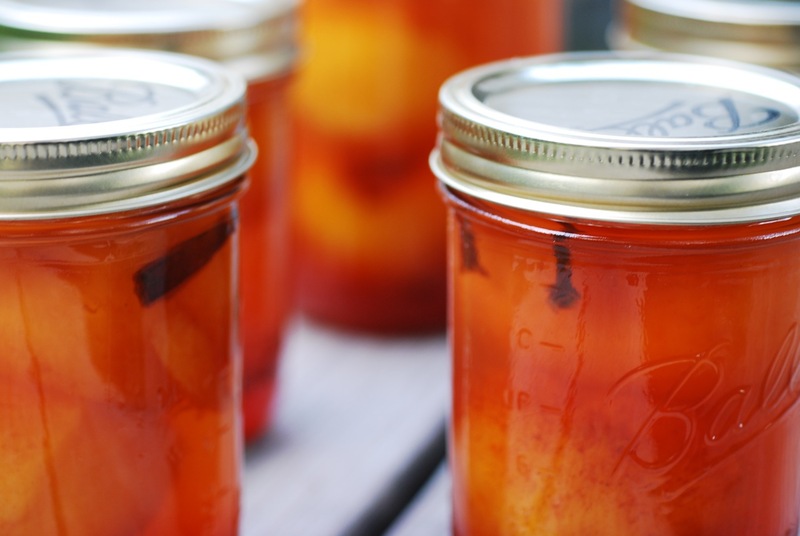 In some places, these are known as pickled peaches, because there is a bit of vinegar in the juice. I've only known them as Spiced Peaches, and they would only show up at our house on Thanksgiving day, just like the green bean casserole, Aunt Junie and Uncle Harry. They were made by Del Monte, and came (I believe) in a quart jar. The last time I checked, I think Del Monte was still making them, but for the "Southern Market", whatever that is. Very distressing, because I must have these for Thanksgiving. 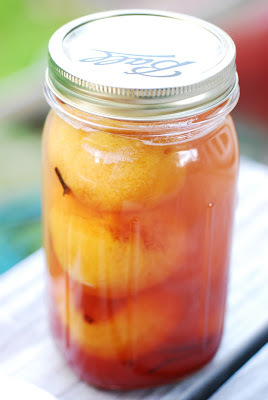 However, it turns out that you can make Spiced Peaches for yourself. It's also a good way to use smaller peaches. Try them and see. 1. Select peaches which will fit in the mouth of your canning jars; there are wide-mouth canning jars available; the best for this purpose are 1-quart wide-mouth jars, which are less common than other types of jars, but worth looking for. 2. 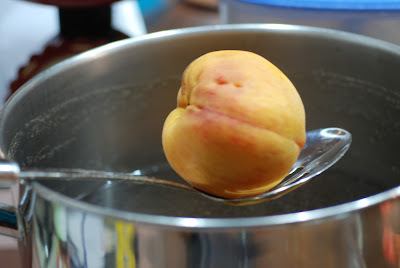 This recipe is for 3 pounds of peaches. Scale it up accordingly. 1. Peel peaches by immersing them in boiling water for 30 seconds, then plunging them in cold water for 30 seconds. Remove loose peel with fingers. 2. 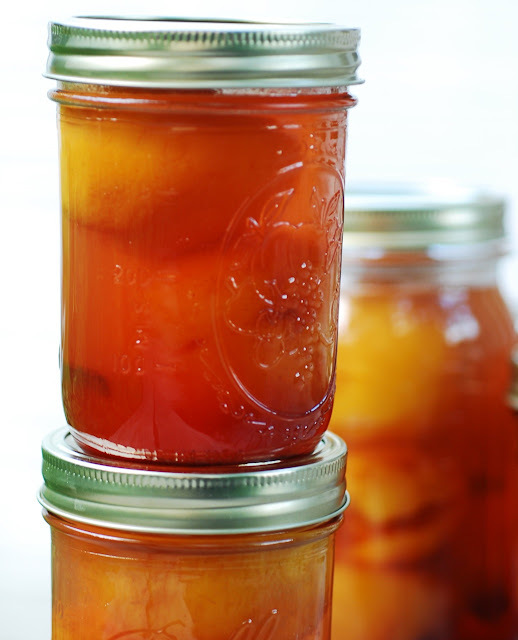 Make syrup: Combine peaches, sugar, vinegar, water, cloves and cinnamon in a large pot. Boil until slightly reduced. 3. 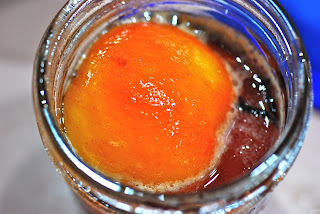 Fill sterile jars with peaches and syrup. 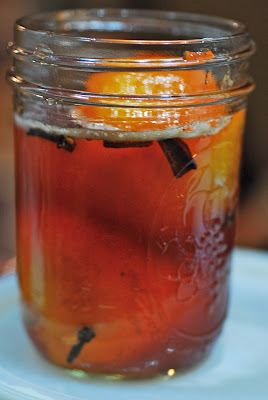 If there is not enough syrup, top off with boiling water to within 1/3" of the top. 4. Seal with new lids. Process in boiling water bath for 20 minutes. 5. Remove from water bath, tighten down lids, and cool. Store in a cool, dark place. 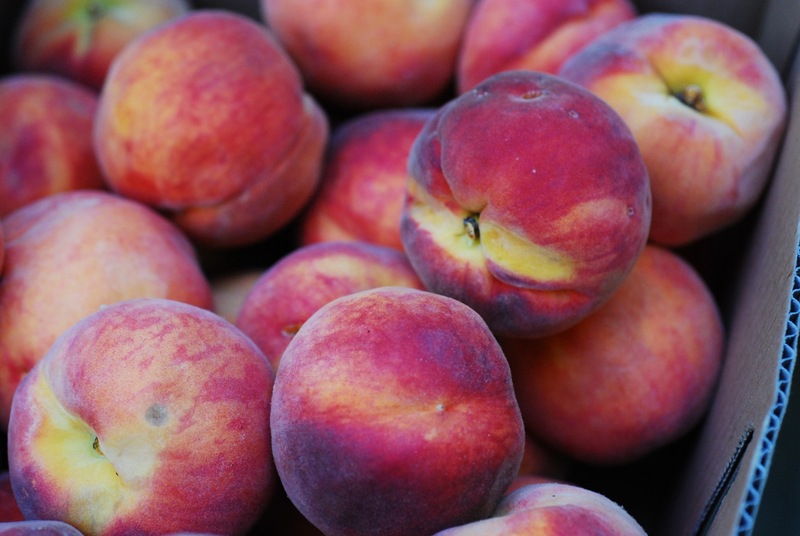 Enjoy these peaches as a condiment with roast meat and poultry.